With quality schools and a focus on the family, Bloomfield knows the importance of providing an atmosphere that is healthy for not only the families that live here, but also the companies who do business here. City of Bloomfield’s elected and appointed officials seek economic development opportunities and are committed to providing a quality of life resident and visitors will enjoy. A focus on beautifying the city, creating green areas to help the environment and being progressive and innovative in its vision and mission for the city are priorities to city leaders. Rio Real Estate Investment Opportunities is an Albuquerque-based park developer that owns Animas Business Park, where Caterpillar dealer Wagner Equipment Co. opened its new 100,000-square-foot facility along U.S. Highway 550 north of downtown Bloomfield, at 200 Louisiana Street this summer. Pyramid Corporation, 4Rivers Equipment Company, and Precision Fitting and Gauge Compny have all purchased land in Animas Business Park, with plans to develop company facilities in the park. Their commitment to the City of Bloomfield shows an economic support from an industry that understands and appreciates all Bloomfield has to offer. 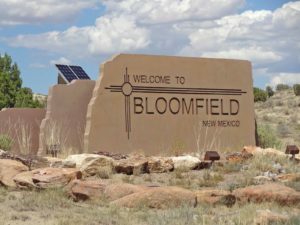 Bloomfield is part of the tri-city area in San Juan County, which also includes Farmington, the county’s largest city, and Aztec, the county seat. Because of its proximity to Navajo Lake State Park, the internationally recognized Quality Waters just below Navajo Dam, the beautiful San Juan River that runs through the town and is a focal point for residents and visitors alike, as well as being the gateway to great hunting, skiing in Colorado, and national treasures – Mesa Verde National Park, Salmon Ruins, Aztec Ruins, and Chaco Culture National Historic Park – Bloomfield is a perfect place for those seeking to relocate their families and/or their businesses.